Your regularly scheduled check-up is often referred to as a "cleaning", but there is much more to it than that! The technical term is "oral prophylaxis", which means prevention of oral disease. Bruxism is the clenching together of both the upper and lower teeth. Clenching can cause pressure on the muscles, tissues, and other surrounding structures of the jaw, and can cause jaw joint disorders, headaces, neck pain, jaw pain, ear pain, tense muscles, and excessive wear on the teeth. 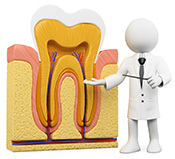 Endodontic treatments are the removal of an infected and often painful tooth-root (rootcanal). In most cases, an infected root is caused by a cavity (hole) that grows deeper and deeper until it reaches the rootcanal.